Pak-Up Hostel i Krabi, Thailand: Bestill nå! 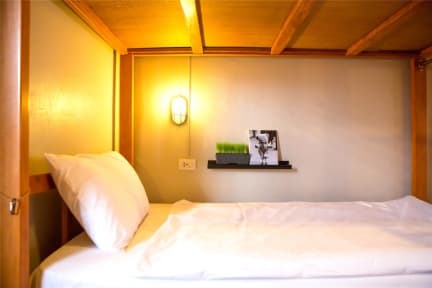 FREE cancellation if you notice us 10 days before arrival date, this hostel reserves the right to charge the full amount cancellation fee according to its cancellation policy. Pak Up quickly created a reputation for being where the buzz is, the most energetic and dynamic place in the area. Our lobby is normally full of backpackers making plans and forging new friendships. Since opening in 2010, Pak Up is the biggest in Krabi. It was the first hostel to open in Krabi Province and remains to this day as the ultimate place to stay. Pak Up could not be better located occupying the main corner in the heart of Krabi Town surrounded by various local markets. Pak Up is a point of transfer including local buses and a boat service to Railey. ‘PLAYGROUND BAR’ offers a free BBQ every night, insane organized competitions with prizes, and the best place to meet awesome people in Krabi. We run our own backpacker ADVENTURE TOURS and with our in house guides you are guaranteed to be well cared for. We also run the biggest and most debauched AO NANG PUB CRAWL KRABI hosted by 5 bars, we hit them harder than anyone. Stay fit while traveling! Try out our NEW functional gym on the roof top(4th floor). With monkey bars, yoga mats, boxing bag, free weights and more. Overlooking the river and krabi town, its the perfect place to get away from it all and focus on that bod'! Don’t forget the great feedback we get about our comfy bunk beds and great facilities. When it’s time to leave, we will arrange your onward travel so you can be rest assured everything will run as it should. What more could you want!!!!! Best beds i slept in in Asia. Good showers. Cool to hangout in the bar area.